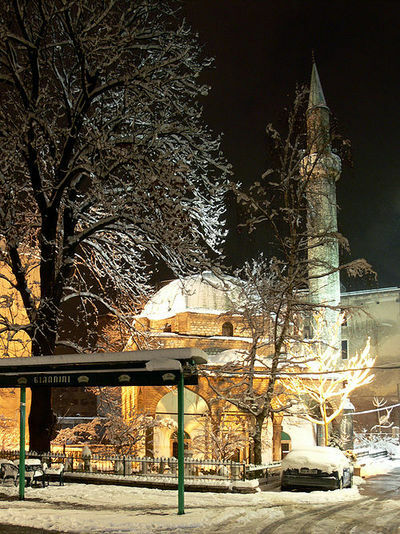 The Ferhadija Mosque, 16th c. CE, Sarajevo – Photograph 2006 by Christian Bickel, Via Wikimedia Commons. Eid Al-Adha has arrived. Known in India as Eid ul-Zuha, to Balkan and Turkish Muslims as Kurban Bairam and to Persian speakers as Eid-e-Ghorban, the four-day festival of sacrifice recalls the mercy of God in preventing Ibrahim (Abraham), the father of Judeo-Christian-Islamic monotheism, from sacrificing his son. Since becoming a Muslim, I have had a special attachment to Kurban Bairam, as it is called in Bosnia-Hercegovina, the place where I accepted the message of Qur'an and the faith of Muhammad. It is seldom mentioned by commentators on the story of Ibrahim and the will to kill his son in God's name that the Canaanite, Phoenician, and Carthaginian religion that competed with the revelation to Ibrahim was based in the offering up of children, by burning in fiery pits. The Islamic commemoration of Ibrahim's release from commission of this terrible deed centers on Mecca, the holiest city for Muslim believers, but will be celebrated by the faithful in the slaughter of meat for the needy everywhere Muslims are found. The mercy of God in sending angels to stay the hand of Ibrahim, substituting a sheep for Ibrahim's offspring, is reproduced in the compassion of the Muslims who distribute the fresh meat to the poor. Instead of killing children, Islam calls on its traditional adherents to feed them. Similarly, one of the first actions of the Prophet Muhammad was to prohibit female infanticide – the murder of "unwanted" daughters, viewed as less valuable than sons – in Arabia. 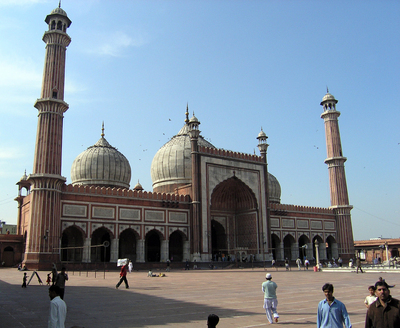 Jama Mosque, 17th c. CE, Delhi -- Photograph 2005 (c) Alex Furr, Via Wikimedia Commons. Indian president Pratibha Patil, although non-Muslim, expressed an appropriate sentiment when she offered, on Eid ul-Zuha, "warm greetings and best wishes to all my fellow citizens and to my Muslim brothers and sisters, in particular. May this unique festival strengthen the foundations of our national unity and harmony and inspire us to work for the well-being of human beings." President Patil's words are especially affecting in that Kurban Bairam comes this year to a world afflicted widely by fecklessness among elites, increasing mass discontent, and aggravated suffering for the disadvantaged. The so-called BRIC nations – of which India is one, with Brazil, Russia, and China – are viewed as vigorous, emerging economies immune, so far, from the financial and political unrest that began in 2007. Nevertheless, there is an unacknowledged gap in the BRICs. Brazil and India enjoy well-established democratic institutions. Yet Russia wallows in the mire of post-Soviet oligarchy and gangsterism, and China, where democracy has many times appeared and in every instance been brutally destroyed, seeks only to maintain the "stability" of oriental despotism. Still, the BRICs are flourishing – which is one reason that writing for Folksmagazine has proven a fruitful and positive experience for me. To have an Indian Muslim and non-Muslim audience for my work is gratifying. India appears poised for a leap into the future, undaunted and worthy of reward. By contrast, a survey of the Old World, which now includes the U.S. as well as Europe, is dismaying. "Crowd outbursts," unworthy to be called coherent rebellions, have disrupted life in Athens, London, and many American cities. They evoke the "Arab Spring" as a model, but lack even the inchoate yearning for democracy seen in Tunisia, Egypt, Libya, Yemen, and martyred Syria. Last week Oakland, California, a city near San Francisco, was briefly taken over by radical leftists who shut down its port and committed widespread vandalism. Senile pseudo-Bolsheviks and juveniles calling themselves "anarchists" momentarily held the attention of the planet. The result was disastrous. The "Occupy Oakland" phenomenon, like similar ructions on Wall Street, and in Athens, London, and Karachi, lacks a social foundation and a coherent vision. The old labor movement has been devastated in the U.S. by the disappearance of the industrial workforce and the bureaucratization of the radical left. "Protest" now involves no more than a battle for crumbs handed down by government. Trade unions now represent, in the main, the interests of state functionaries. Socialism appears discredited utterly. But equally, capitalism in the U.S., Britain, and other former leading nations seems in question. How does a Sufi Muslim like me, originally a revolutionary communist, then a neoconservative, later a witness to the horrors produced in the former Yugoslavia by the heritage of the Soviet revolution, and more concerned than ever for the welfare of humanity, approach the current upheaval? It was pathetic to see, in Oakland, mostly-unemployed people attempting to prevent port workers from earning their living, while the interlopers proclaimed a "general strike" that was no more than a diversion. It was equally absurd that nihilist youths would smash the glass walls of banks in the name of "anarchism." 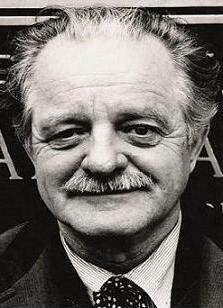 Kenneth Rexroth, 1906-82. Photograph by Morgan Gibson. I studied anarchism at the knee of Kenneth Rexroth, an American poet who was crucial in the introduction of Buddhism to Western audiences and read deeply in the Hindu classics. 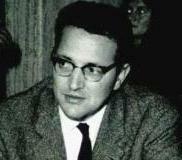 Rexroth had been in contact with such Indian thinkers as Manabendra Nath Roy, who evolved through Communism to Radical Humanism. The social-revolutionary anarchist outlook was then intrinsically bound up with the non-violence of Gandhiji and Vinoba Bhave. All of these figures believed that Indian society could produce its own forms of democracy without attempting to imitate or impose Western models. The distance between the idealistic, voluntary, anti-authoritarian anarchism of the "founders," such as the Russian Peter Kropotkin, whose works Rexroth recommended, and the aimless violence of youths garbed in black and breaking the windows of shops and banks, could not be wider. Decades later, I had learned empirically about Islam from the noble example of the Bosnian Muslims. They defended their homes, families, and collective identity while maintaining a national self-discipline. The latter aspect of their character prevented them from reprisals against the Serbian and Croatian attackers who killed, raped, blew up shrines, and expelled hundreds of thousands from the lands the Bosnian Muslims and their ancestors had inhabited for millennia. I came into Sufism through the teachings of the Bektashi order, which is centered in the Albanian lands and supports a secular state, universal popular education, and the equality of women. I was introduced to the Alevi-Bektashis of Turkey, who consider themselves part of the international left as progressive activists, and the Ahl-e Haqq of Iran, practicing an ecstatic, liberated Sufism. The arc of my life became circular when I "returned" to South Asia by reading Allama Iqbal, who continues to inspire me. 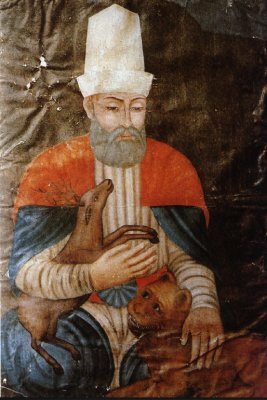 Traditional Image of Haxhi Bektash Veli, Progenitor of the Bektashi Sufis, 13th c. CE. I believe that Sufism in the West, like spiritual Catholicism and Buddhism before it, has become a substitute for the failure of socialism. Seeking love and empathy, and failing to encounter it in the radical left, visionaries young and old turn to eastern wisdom in the way an Albanian Catholic poet I knew and admired, Martin Camaj, wrote: "the soul craves easement." Camaj experienced Communism in its worst form – that of the dictator Enver Hoxha in Albania – but was fulfilled in his life and work by his Christian faith. Similarly, perhaps, Mother Teresa, an Albanian, went to India to find a place where she could exercise mercy and compassion in the presence of what another poet I knew, the American Philip Lamantia, called "the luminous darkness of God." 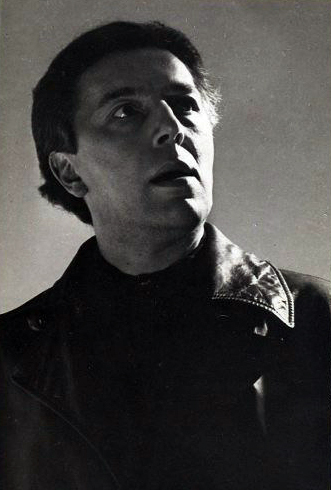 Rexroth had written of Lamantia and other San Francisco poets who emerged 65 years ago, "one of the characteristics of all these new people was, to put it bluntly, mysticism." They were anarchists, pacifists, and religious believers, in defiance of the satanic illusion of Russian Communism that had misled the generation before them. What, one may ask with reason, has this to do with the tumult in the lives of millions caused by the Western financial breakdown? With the eruption of rage by those who feel "cheated" by their exclusion from the promise of European unity no less than from the "American dream"? With the panic spreading from Greece to the U.S., and what one can only describe as an abyss opening up before the inhabitants of the West? As I have indicated repeatedly, Sufism has always had a social aspect. The Muslim author Khalid Duran traced the Sufi inspiration to grievances against the corruptions of wealth and showed a fracture in Islamic history between the mystics, who are pluralists and lovers, and the "legalists," who are hunters of heresy and haters. This conception runs as a bright thread through much writing on Sufism, including works of the most respected academic researchers. Commentators on Iran and its literary culture have noted particularly the role of the Sufis as permanent dissidents, "speaking truth to power," to employ a phrase that, in the West, has become a cliché, but retains great significance. Sufis in Muslim lands have sheltered refugees and the homeless, fed the hungry, and otherwise provided a "safety net" for those crushed by oppression and poverty. 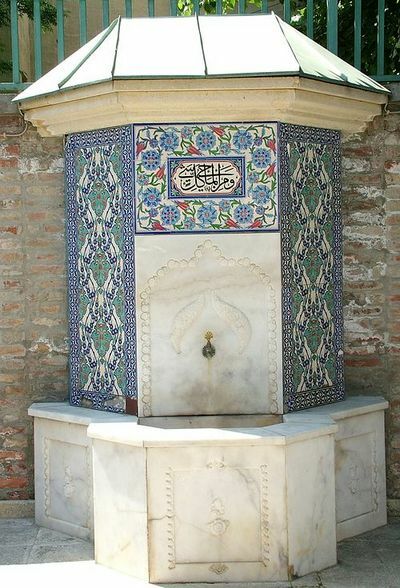 Fountain at the türbe of Bektashi saint Gül Baba, Budapest, 16th c. CE.– Photograph 2008 Via Wikimedia Commons. The late Israeli sociologist Shmuel N. Eisenstadt, who theorized "Islamic pluralism" as the mode of governance of the great Muslim empires, argued against "the wrong perception of rulers of Muslim societies as Oriental despots. This image is wrong because the scope of decision making by these rulers was relatively limited." The Muslim clerics, pious endowments, and Sufi orders, according to Eisenstadt, "provided arenas of life not entirely controlled by the rulers." I would add to these pluralistic social institutions the trade and commercial guilds prevalent throughout Muslim societies. Sufism is not the sole example of a religio-mystical trend that encompassed principles of social responsibility. Jews were prominent in the development of democratic socialism, Protestants in trade unionism, and Catholics in the formation of the Polish Solidarity movement that undermined decisively the tyranny of Muscovite Communism. I recall personally and vividly the 1974 railway workers' movement in India, led by George Fernandes, which anticipated the emergence of the Janata party in opposition to the Emergency proclaimed by Indira Gandhi. I was then a Marxist and railroad worker, having given up (temporarily) my literary ambitions for the cause of labor. Fernandes was a hero for some of us, no matter how distant he may have been from us in geography and culture. In search of a similar "radical humanism," many Muslims believed in the neo-fundamentalist political movement in Turkey, the so-called Justice and Development Party, or AKP according to its Turkish initials. Led by prime minister Recep Tayyip Erdoğan, it promised an "Islamic democracy" comparable to Christian Democracy in the West. The AKP was founded by Sufis drawn from a group avid for access to worldly authority. We now see this chimera reappearing in the form of the "new" Muslim Brotherhood parties in Tunisia and Egypt. It has long been noted that Hamas, the ferocious terrorist arm of the Muslim Brotherhood among Palestinians, owes much of its support to the social services it provides; the same is said of the equally bloodthirsty Hezbollah in Lebanon. But the AKP, the Muslim Brotherhood parties, and Hezbollah are all false alternatives, as criminal as the Canaanites who burned children alive. They have adopted a spurious moderation to solidify their political dominance. Where they will lead the people of Turkey, Tunisia, Egypt, Gaza, and Lebanon cannot be predicted, which is a large part of the problem. Lacking a serious programmatic orientation, they proclaim "Islam is the solution," but interpret the religion in rigid and extreme terms. In phrases beloved of Islamophobes no less than by Islamist radicals, Erdogan emphasized recently, "I do not accept the expression 'moderate Islam.'" He thus repeated a declaration of 2007: "There is no moderate or immoderate Islam. Islam is Islam." But this is empty rhetoric and mischievous demagogy. God tells Muslims in Qur'an (2:143), "We have made you a community of moderation that you might bear witness to people." The great theologian of the third Islamic century, Imam Tahawi, stated in his Aqida or Creed, "Certainty and despair both remove one from the religion, but the path of truth for the People of the [Islamic] Qibla lies between the two." Any Muslim who has travelled between Sarajevo and Singapore knows there are many ways to be Muslim, just as there are many ways to be Jewish or Christian or Buddhist or Hindu, differing according to language and customs, and according to moderate and radical attitudes. The sacrifice of Eid Al-Adha – Eid ul-Zuha – Kurban Bairam – Eid-e Ghorban represents a promise of security and prosperity for the righteous and the innocent. Interpreted through the Sufi classics, this aspect of Islam may contribute to regaining the serenity and balance needed so desperately by the peoples of the developed countries today. The history of Sufism is convoluted, and has many chapters in which the egalitarian and libertarian aspects of Islam were betrayed in the interest of dominion in this world. But as the French poet, revolutionary, and mystic André Breton wrote, we "hear the human fabric torn apart like a great leaf," between the forces of greed and of resentment, in today's global society. The time may have returned for Sufis to intervene more actively and directly in human affairs: to become, as in the past, revolutionaries – moderate, opposed to violence and statist dictation, but still seeking human solutions for humanity's dilemmas. As Qur'an (13:11) teaches us, "God will not improve the condition of a people unless they improve what is within them." With this in mind, I pray at Eid Al-Adha – Kurban Bairam for blessings on all Muslims, and the betterment of all non-Muslims. 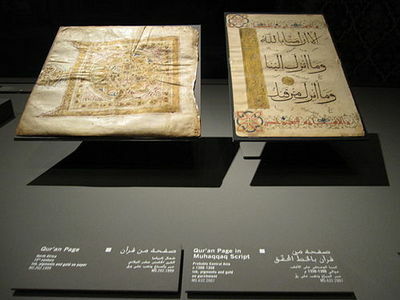 Qur'an exhibited at Doha, Qatar, 2011 -- Photograph Via Wikimedia Commons.